I’ve been flirting shamelessly with science fiction this time! 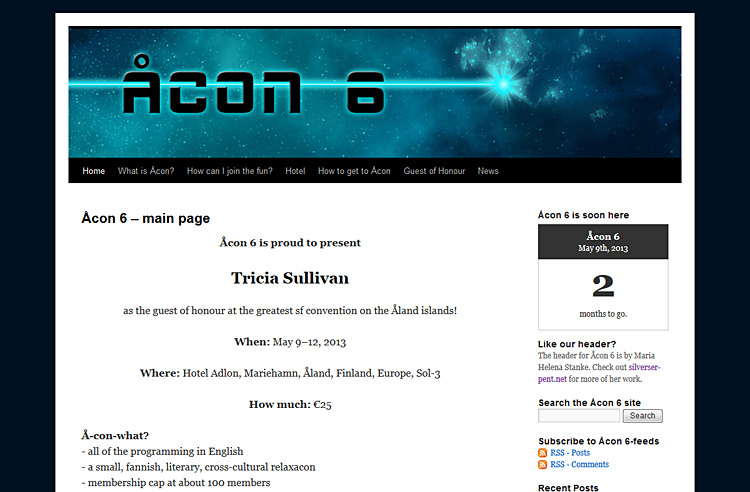 I’ve made a small graphic profile for the Åcon 6 website and am currently working on the front page of the program folder that will be used at Åcon 6. Åcon is a science fiction convention in Mariehamn on Åland in May, so space and a laser beam seemed very fitting. The nebula has the same shape as Åland, by the way. This was a small commission, but nevertheless very inspiring since I’m more accustomed to the fantasy genre. Read more about Åcon 6 here.